Edward Toby was born February 9, 1858 in New Orleans. His father was a merchant and business man known for having provided supplies to Sam Houston during the Texas Revolution. Edward acquired an Engineering degree from Virginia when he was eighteen years old and then worked for several companies in New York City and New Orleans before arriving to Waco in 1883. Toby worked several jobs in Waco. He was a clerk, a grocer, salesman and even had some cattle until he was hired to be the bookkeeper for Provident National Bank. There, his handwriting and professionalism caused co-workers to suggest that he try teaching his skills to others. So on the first of June 1890, Toby began to provide three night classes per week. These lessons proved successful and his training was in such demand that by July 1893, he left the bank to teach full time. Toby’s Business School focused on practicality in business training. He made little use of textbooks and sought to train pupils in the useful skills needed to succeed in various kinds of office work. Admission was stringent. People with reputation for overdrinking, smokers, poorly groomed and questionably moral men were denied. 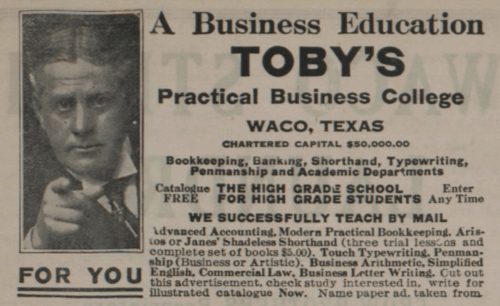 By 1896, enough outstanding young men had enrolled that Toby’s Business College was able to field a football team against TCU in their first football game. It would be another three years before Baylor had a team at all and its first game was also against Toby’s Business College. During the summer months, Edward went out to New York where he maintained another similar school. In 1898, he moved his school from his home to a rented upstairs space at 215 South 4th Street.Toby’s Business School applied for and received a charter in 1899. The school flourished most definitely after that. 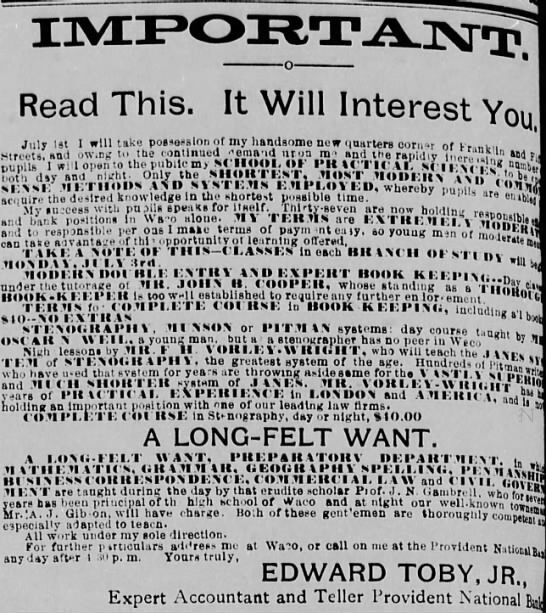 In 1900, Toby was running recruitment ads boasting about the cross-country trips on which he took top students as you can see in the clip below. 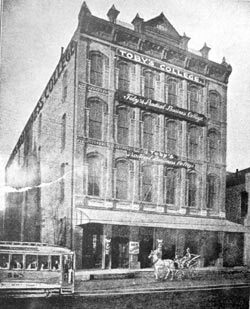 In 1910, Toby spent a present-day equivalent of almost one million dollars to build a four story brick building at 4th and Webster. Having started out with an aversion to books, Toby achieved notoriety by writing his own books regarding various aspects of the business life. Administration, practical math, bookkeeping and penmanship were among the topics covered. Toby’s Business College was considered to be one of the largest business schools in the country. His expertise in handwriting was well established that attorneys often brought him in to consult on court cases. It would seem that he continued thriving until the Great Depression. The most likely explanation is that with the rising poverty rates, there simply were not enough people able to afford the luxury of business school. Toby’s Business School and the financial health of its founder never recovered. He died in 1937. One of his students and former employees, Sam Knight, founded the 4C Business School in Waco that achieved great success until its demise in the 1990s. Ed Toby was a member of Waco Lodge 92 and his school produced dozens of men that became members here. Some of them served as Worshipful Master: E.C. Canon, Sam Moore, William Curry, Charles Durie, Ray Hodges, Oscar Griffin, Doyle Carpenter, Giles Lester, and our own legend William F. Quebe.